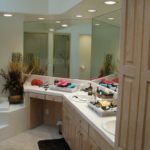 This showstopper master bathroom in Scottsdale’s Gainey Ranch community has gone from drab and boring to bright and beautiful. 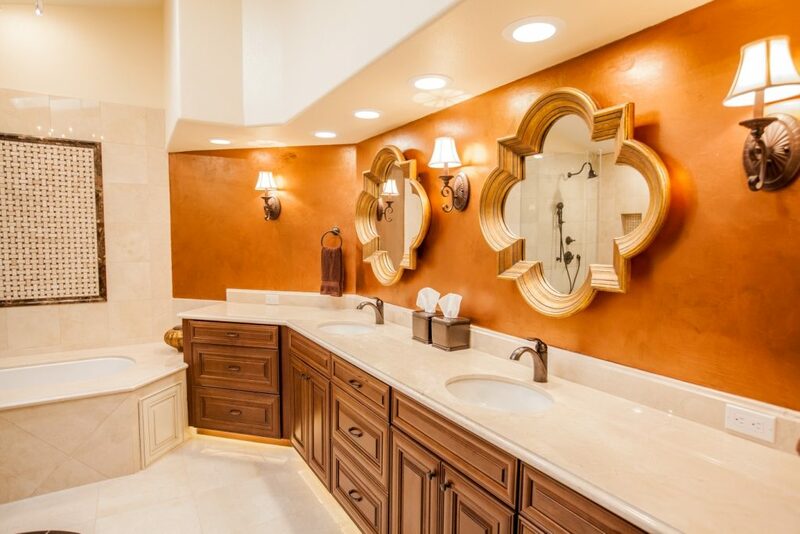 Adorned with high-end finishes this Gainey Ranch Bathroom Remodel Scottsdale AZ is dripping in details. The custom cabinetry is designed with a two-tone cherry Bordeaux and satin white with chocolate stain color palette. Custom details include: intricate stacked crown molding, furniture style carved legs, clear glass accent doors, decorative furniture end panels and a raised panel door style to emphasize the glazing and texture. 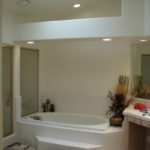 The tile was a labor of love to design and install. Emperador Dark and Crema Marfil marble tiles compliment the two tone cabinets, marble countertops and tub deck. The shower floor is a marble mix mosaic with Emperador Dark, Emperador Light and Crema Marfil. The custom floor medallion adds layers of color with the Indian Premium Black granite border and the accent of Rojo Alicante Marble within the design. The basketweave mosaic tile focal point is framed in Emperador Dark ogee trim tiles. A feature lighting fixture brings drama and embellishment to this stunning space. Crystals dangle from the large scale chandelier. The bronze iron scroll work emphasizes the details of the marble medallion below. Delicate sconces provide soft light at eye level while peering through the gold embellished arabesques shaped mirrors. Along the toe kick, ambient LED tape lights provide a glow to WOW the most discerning of visitors. 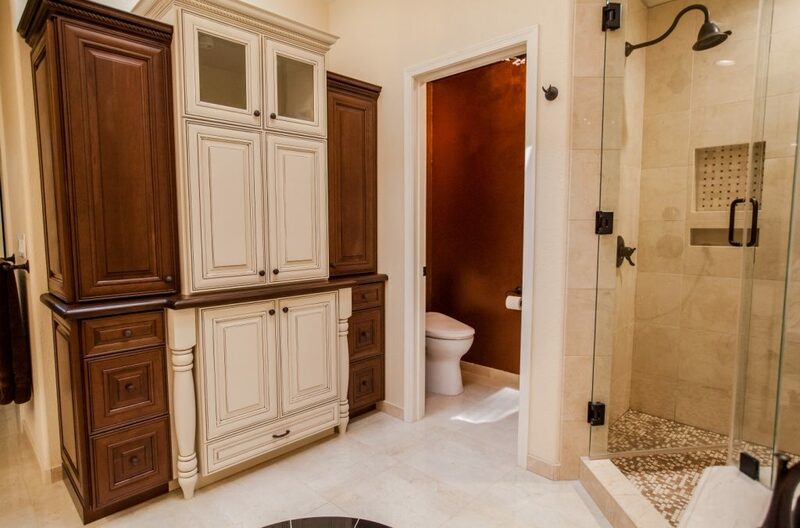 To make this Gainey Ranch Bathroom Remodel Scottsdale AZ even more elegant, a one-of-a-kind Venetian Plaster faux finish was applied to the backsplash and commode room. This masterful technique gives depth and texture in a way that no singular paint color can. Like the frosting on the cupcake, this wall finish ties all of the design elements together bringing harmony to this amazing Master Bathroom. 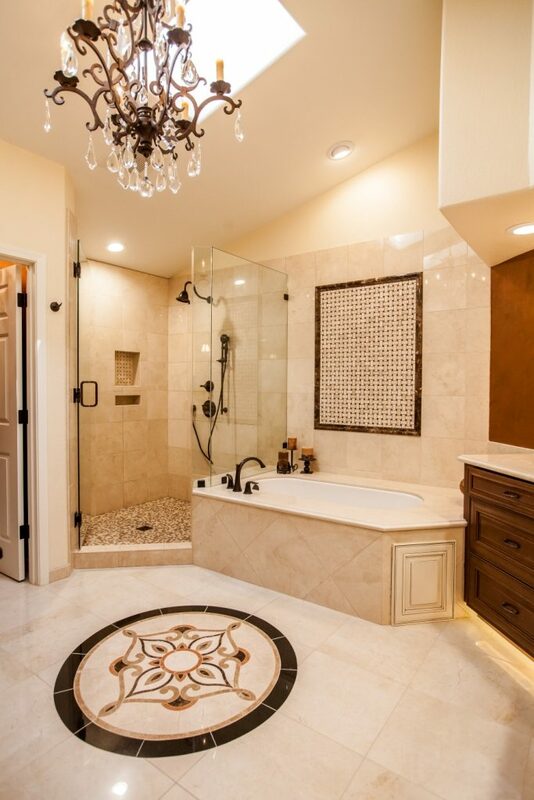 Another stunning bathroom remodel complete.